Dante was just 9-years-old when he first glimpsed Beatrice. The historic fact, crucial to Dante’s personal and artistic life, happened at a May Day party at Beatrice’s father’s house. 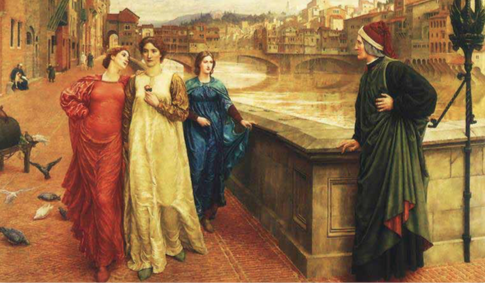 Dante fell in love instantly, al- though on that occasion he did not speak to Beatrice. “From that timeforward, love fully governed my soul,” he wrote in one of history’s greatest love poems, La Vita Nuova [The New Life]. From that moment on, the divine poet began to show up in the places where he knew he could catch a glimpse of the woman he was des- tined to love forever. Just admiring her from a distance was enough to fuel his love. It was only nine years later, in 1283 when he was 18 and she was 17, that she spoke to him for the first time. She was walking along the bank of the Arno, wearing white, accompanied by two older women. Passing Dante, she turned and greeted him. Such was the emotion and the joy, that he rushed to his room where he instantly had the dream that became the scene of the first sonnet in the Vita Nuova: “As they walked down the street she turned her eyes toward me where I stood in fear and trembling, and with her ineffable courtesy, which is now rewarded in eternal life, she greeted me; and such was the virtue of her greeting that I seemed to experience the height of bliss. It was exactly the ninth hour of day when she gave me her sweet greet- ing. As this was the first time she had ever spoken to me, I was filled with such joy that, my senses reel- ing, I had to withdraw from the sight of others. So I returned to the loneliness of my room and began to think about this gracious person.” (La Vita Nuova III). After Beatrice died, Dante, devasted, devoted the rest of his life to his muse. Arranged marriages were custom- ary in Medieval Florence, partic- ularly amongst the upper classes. At the age of 21 Dante married Gemma Donati, while a year lat- er Beatrice wed Simone dei Bar- di. Tragically, she died only three years after. Dante, devastated, re- mained devoted to her for the rest of his life. Although her physical influence was minimal in Dante’s life, Be- atrice is perennially present throughout. Forever, she will be the highest allegorical representation of spiritual love, the key to Paradise leading to ‘salvation’, the metaphor for the search of God, the Divine Love.